President Maithripala Sirisena says all politicians of this country, irrespective of their party affiliations, should be held responsible for the division among the people of the country based on their language of speaking. The President emphasized that people should not be divided according to their spoken language, addressing a function held at the BMICH yesterday. The ceremony was held for the launch of the simplified Sinhala language translation of the holy Quran. It is significant that this translation is in simple Sinhala language, in order for people to understand the history of Islam, as well as to understand the culture and religious background of the Muslim people. This initiative was taken under the patronage of the All Ceylon Jamiyyathul Ulama, using the guidance of Islamic scholars. President Sirisena, expressing his views further said that the division of the society according to the spoken language has been a major hindrance for the programme of building national peace and reconciliation in the country. The President emphasized that this division should be completely eliminated with understanding and mutual trust between all the communities and religions and added that the translation of the holy Al-Quran into simple Sinhala language was a significant milestone in the process of building national unity and reconciliation. The President also pointed out that the classification of schools by language should be brought to an end and he further said that it is of utmost importance to expand the trilingual national school project commenced at Polonnaruwa on a concept of him, to other regions of the country. 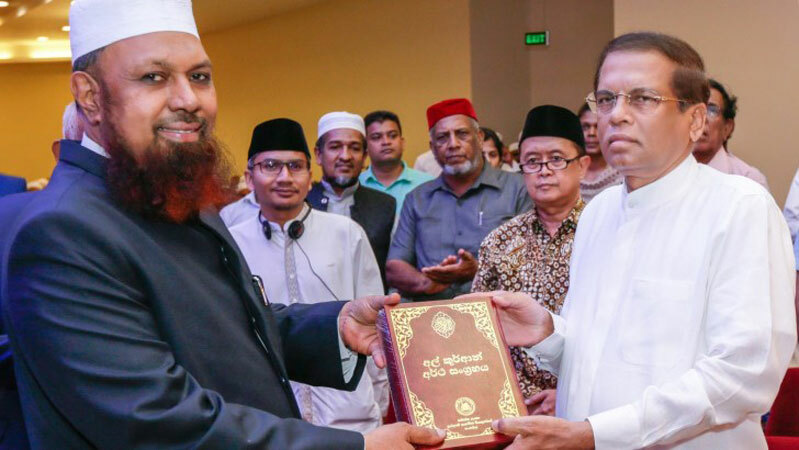 The first copy of the holy Quran translated into Sinhala was presented to President Sirisena by the Chairman of ACJU Ash-Sheikh M. I. M. Rizwe Mufthi. Islamic priests, former Minister Attorney-at-Law Imthiaz Bakeer Markar, President’s Counsel Fais Mustafa, the Secretary of the ACJU M. M. A. Mubarak and ACJU members were present on this occasion.